At KPMG, we put our skills, experience and actionable insights to work to empower positive change for our clients. As the U.S. member firm of the global cooperative KPMG International, our 24,000 professionals and partners in Audit, Tax and Advisory are passionate about your success. Using a cross-functional and collaborative approach, we help propel the world’s leading organizations toward a successful future while optimizing current performance. We activate deep subject matter knowledge and experience to provide you with insights to consider in today’s decisions, for the greatest impact tomorrow. 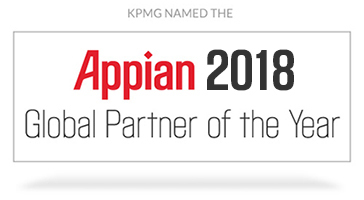 To learn more about our strategic alliance with Appian please visit kpmg.com/us/appian.